Trophy figures and Medals are available for almost any sport or event you can think of, please call or email us with specific inquiries. Customize your trophy order with custom size columns, laser engraved plates and a wide selection of mylars to choose from. 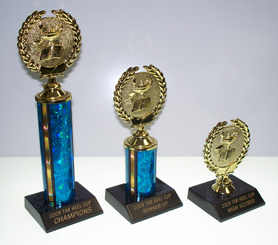 We also offer larger bases for BIG trophies with 2, 3 and even 4 columns. More samples of over sized trophies coming soon. 14.5" tall Victory Trophy DT-RFV1 Call for pricing.